Amount – specify the amount of payments. 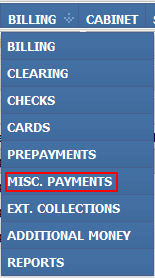 After you click “Search”, section 2 will be filled with specified payments. Here you can choose Ordering facility, Date and amount of payment, and write down the comment if needed. Edit selected – opens entry editing dialog window. Edit dialog window looks exactly same as the previous one.